Richard Bland College of William & Mary prides itself on being your transfer institution of choice. For many students, earning an Associate degree at RBC is a key component of their journey. An RBC degree makes your academic pathway visible, viable, and affordable. With all of our transfer partner institutions, Richard Bland College is a wise choice for the savvy student. To make sure that your pathway works, follow the guides in the following section when selecting your coursework and note any required GPA or course grade guidelines in terms of transferability. Generally, keeping above a 3.5 GPA gives you the best transfer options, maintaining a 3.0 GPA provides numerous pathways to the bachelor’s degree, while keeping a 2.5-2.8 GPA will limit your choices. Being aware of all of this important information can seem confusing, but taking the time to plan ahead will help ensure your successful transfer. When in doubt, talk to your Learner Mentor here at RBC, and be proactive and review your course schedule and course progress with the transfer admissions specialist at the transfer institution of your choice. Please note that any remedial courses you might have needed do not transfer to a four-year institution. Some courses–even some that look quite similar–sometimes will have a closer alignment with a four-year degree pathway, so always confirm your chosen course will work towards your chosen academic pathway. Generally speaking, a year of high school foreign language is equal to one semester of college-level study of a foreign language. Tell me your name, where you are from, and where you live now. Tell me a little about yourself (hobbies, interests, sports, work, anything you know how to say in Spanish/French). Can you tell me (briefly–in 1-2 sentences) what you did yesterday? Students may respond to these questions either orally or in written form. They should email either their written responses or an audio file of their recorded answers to provost@rbc.edu. In this next section, you’ll find a number of guides to assist you and your Learner Mentor in your course selection process. Whenever possible, try to think not only about the courses you’ll need to graduate from Richard Bland College, but also think ahead to what courses you’ll need to successfully graduate from one of our four-year transfer partner institutions. When in doubt, don’t hesitate to reach out to a transfer counselor at your chosen four year school(s) to confirm. Courses in italics are only transferable in some cases, and you should exercise caution. Course with an asterisk (*) may be used to satisfy the requirements of only one category. A student may not satisfy the requirements in both the Human Experience and US & World Cultures exclusively with Philosophy and Religion courses. NOTE: For the AA Degree, two semesters of foreign language are required to complete the degree requirements. For the AS Degree, the foreign language classes are all considered electives (none required). If you’re planning on transferring to a four-year institution, this list was created to help. Here you’ll find Richard Bland College courses that almost always transfer, no matter which institution you plan on attending next. Other courses may transfer, but these courses count both towards your degree requirements at Richard Bland College, and are also highly transferable (although the four-year institution makes the final decision). Please note that any course in italics requires as corequisites or prerequisites ENGL 101 and/or MATH 121. Second, any course marked with an asterisk (this mark *) can be used to satisfy the requirement of only one category. We’ve created this guide to help you see which courses are most likely to transfer to a four-year institution. 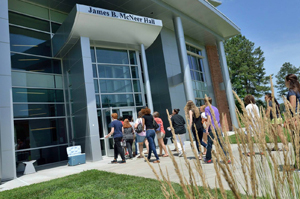 As you choose which electives you’d like to take at Richard Bland College, you should also check and see whether this course is likely to transfer to a four-year institution. *Please refer to the Core Courses List for a complete list of course choices and categories for which they satisfy. *PHIL 101 and 203 require a corequisite of ENGL 101.